The Canadian Institutes of Health Research’s Institute of Musculoskeletal Health and Arthritis(CIHR-IMHA) is pleased to announce that Bone and Joint Canada (BJC) is the recipient of the 2013 CIHR-IMHA Knowledge Translation Award. 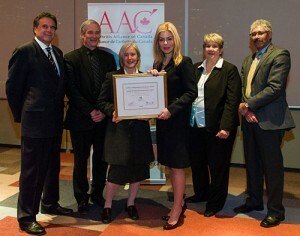 Ms. Eve Adams, Member of Parliament for Mississauga-Brampton South and Parliamentary Secretary to the Minister of Health, presented the award at the opening reception of the Arthritis Alliance of Canada’s Conference and Research Symposium. BJC was formed in 2002 to represent Canada on the International Bone and Joint Decade launched by the World Health Organization in 2000 as a global partnership to reduce the impact of musculoskeletal health conditions. BJC received the award in recognition of its outstanding contribution over the last ten years in engaging stakeholders, building research capacity, sharing best practices, and developing and implementing national models of care for hip and knee replacement and hip fracture. The CIHR-IMHA Knowledge Translation Award honours and supports exemplary knowledge translation efforts and activities of an exceptional individual, team or organization that has made an outstanding contribution to increasing the application of research findings, improving the health of Canadians, health services and products or strengthening the health care system. BJC wants to acknowledge all the work across the country in all the provinces to implement changes for patients so that they experience improved access and quality of care. It is this hard work and commitment that has been demonstrated by all the BJC membership that has lead to this award of recognition. BJC looks forward over the next few years to support the work to continue to improve care in hip and knee replacement and hip fracture and looks forward to the challenges of working with the primary care in improving care for patients with musculoskeletal conditions.